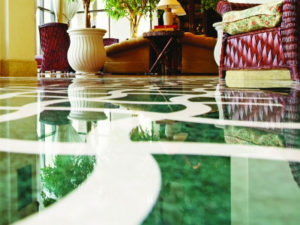 We are the Marble Cleaning, Polishing, Repair, Sealing, Restoring, and Maintenance experts in South East Florida. If your marble is dirty or dull-looking, scratched, etched, cracked, chipped, or otherwise damaged, don’t replace it! We can restore your marble, not just making it look better, but making it look brand new again. Our professional marble floor and surface care and maintenance services for residential properties include expert interior and exterior cleaning and sanitizing, honing and polishing, repairs, sealing and protection, and more. The misconception that because marble is a stone it does not need any maintenance is far from the truth. All marble needs some type of care and maintenance. Your marble needs depend upon where it is used— floors, walls, countertops, vanities or shower walls. If you have a marble floor, wall, countertop, vanity or shower that has become etched, has lost its shine and beauty or is in need of repair, then it is time to call a professional marble restoration contractor. Marble Plus Floor Care serves Palm Beach , Broward and Dade Counties and can repair, refinish, protect and restore your marble, onyx and all other natural stone back to its original condition. At Marble Plus Floor Care we not only perform these services, we can instruct you on the proper care you should use in cleaning your marble. We offer a full line of Care Products to assure you are using the proper cleaning product that will give your marble the beauty you desire. Give us a call today at (561) 641-4505 for a FREE estimate on your marble cleaning, polishing, repair, maintenance, and restoration needs throughout the Palm Beach, Boca Raton, and Ft. Lauderdale area. We look forward to serving you!